Colistin is an old drug with a troubled past that is currently used as a ‘last resort’ antibiotic. In this article, an infectious diseases pharmacist discusses five things to know about colistin. Colistin is an injectable polymyxin antibiotic used to treat infections caused by Gram-negative bacteria. It was discovered in the 1940s and first used in clinical practice during the 1950s. In the 1970s with the advent of safer alternatives, colistin was largely abandon, but then as resistance to the more contemporary antibiotics became increasingly prevalent it experienced renewed utility in 1990s for treatment of patients infected by multidrug-resistant (MDR) and extensively drug-resistant (XDR) organisms. In recent years with the FDA-approval of drugs like ceftazidime-avibactam (Avycaz), ceftolozane-tazobactam (Zerbaxa), and meropenem-vabomere (Vabomere), new therapies for XDR and MDR organisms are again emerging and this should allow us to once again move away from using colistin in clinical practice. However, it is unlikely we will be able to completely abandon colistin any time in the near future. Most pharmacists and physicians who practice outside the specialties of infectious diseases, pulmonology, or critical care likely have little experience with colistin. It is virtually never used in an outpatient setting (except when given inhaled) and within many hospitals it is typically only used under extreme circumstances as a ‘last resort’ antibiotic. I have had the opportunity to spend several years studying colistin literature as well as researching it in clinical practice. The data with colistin is very complicated, publications investigating its use are highly variable, and there is a fair amount still left to learn about colistin. In an effort to assist others in identifying some key points about colistin and also secondary to a general personal interest in the topic, the following is provided. 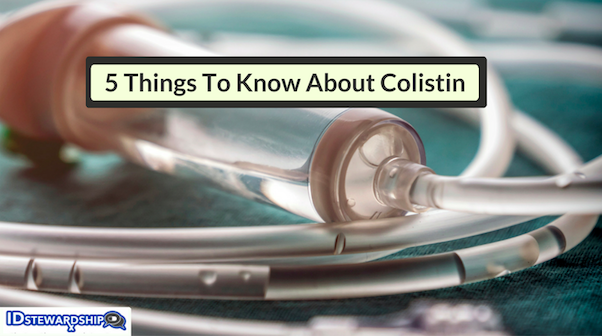 Here are five things to know about colistin. NOTE: This is not a systematic review, some of the content in this article represents the opinion of the author, and due to the complexity of this topic some content is a bit oversimplified. Readers are directed to the references at the end of this article for additional reading. Also, while colistin can be administered by inhalation, intrathecal, or topically, this article focuses on intravenous colistin. It would be nice if colistin only had one name and was available in its active form for administration. Unfortunately this is not the case. Colistin is provided as a prodrug called colistin methanesulfonate (also known as colistimethate sodium, CMS), which once administered is slowly and spontaneously hydrolized in vivo to colistin. Colistin itself (also known as polymyxin E and measured in colistin base activity [CBA]) is a cationic polypeptide antimicrobial consisting of over 30 components (colistin A and colistin B being major components). In a review of 51 colistin publications, we found the product and dosing convention was reported in 6 different ways . The most frequent was international units of CMS (n=13 studies) and the second most frequent was as milligrams of CBA (n=12 studies). Notably European studies more commonly report colistin in international units of CMS, while the Americans more commonly report it in milligrams of CBA. This variation within literature continues to be a cause of confusion today. One reason the literature is unclear on the colistin nephrotoxicity rate is due to varying study designs, including numerous criteria that have been used to define nephrotoxicity. In recent times we have seen more consistency and this has helped, as researchers are more commonly using the RIFLE criteria for acute kidney injury (AKI) within their definitions . A second factor contributing to difficulty studying colistin nephrotoxicity rates is the inherent heterogeneity among patient populations treated with colistin. Drug exposure, severity of illness, age, and other factors potentially contributing to nephrotoxicity can be difficult to control for when the study cohort existing for potential inclusion is small. Both have these factors have imposed considerable limitations on the validity of study outcome comparisons. Data also suggests that nephrotoxicity of colistin is related to exposure, and with higher doses patients will have greater chances of nephrotoxicity . For this reason many clinicians are hesitant to exceed a colistin dose of 300 milligrams of CBA in adults . There are two positive notes. First, if a patient experiences nephrotoxicity while receiving colistin (and survives), the nephrotoxicity is generally reversible . Second, concomitant administration of substances such as ascorbic acid are being studied and may help in reducing colistin-associated AKI . What is the right dose of colistin to use? I do not know the answer to this question and I do not believe anyone else truly knows either. We have learned more in the last decade about trying to get the dose right from new pharmacokinetic (PK), pharmacodynamic (PD), and clinical data, yet knowledge gaps persist and many clinicians lack confidence when selecting a colistin dose. Colistin was developed and brought to market prior to the more rigorous requirements of the modern drug approval processes. This means the PK/PD data that would be required to bring a drug to market today was not required at that time. Researchers have been working hard to identify the PK/PD profile of colistin and our understanding of this topic has improved over time, but the most efficacious and least toxic method for employing colistin remains unknown. Of note, the package inserts for colistin in the United States are generally regarded as incorrect and will likely lead to under-dosing. Part of this is due to the fact we now know loading doses should be used to obtain adequate serum concentrations in a timely fashion . Loading doses are not even mentioned in the package inserts for colistin products in the United States. Successfully employing an antimicrobial means getting sufficient quantities of drug to the site of infection where the pathogenic organism can be killed. With colistin one major factor impacting this that has implications for dosing considerations is renal excretion of CMS (the prodrug of colistin). Patients with good renal function will excrete CMS faster than patients with poor renal function. This means patients with good renal function can remove a lot of CMS from their body before it has the chance to convert to the active drug colistin, which in turn means less antibiotic at the site of infection. With concerns for higher doses causing more nephrotoxicity, pushing doses higher may not be an option. As a result, for patients with good renal function +/- a difficult to penetrate source +/- an organism with a high minimum inhibitory concentration, colistin may not be a therapeutic option. There is a fair amount of data from the lab and human studies that suggests colistin is most effective when used in combination with other antibiotics. 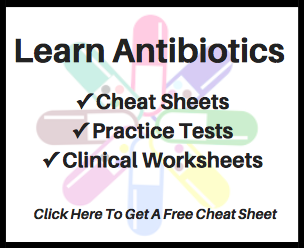 Which antibiotic to use with colistin is something that needs to be answered on a case-by-case basis depending on what the organism is, what the organism’s resistance pattern is, what the patient can tolerate, what type of infection it is, and other data available to help make clinical decisions. It is probably most common for clinicians to combine colistin with a carbapenem. Polymyxin B is like the brother to colistin (polymyxin E). Unlike colistin, polymyxin B is administered intravenously as the active drug and thus has a more reliable PK/PD profile as compared to colistin . Some studies have compared polymyxin B to colistin, however the data is not robust enough to make a call on which one is safer and more effective . For now we know that either can be an option, and neither are drugs clinicians look forward to prescribing to their patients. Of note, colistin will likely remain the polymyxin of choice for infections isolated to the urinary tract, since it achieves considerably higher concentrations at this site as compared to polymyxin B.
Colistin resistance via the plasmid-mediated MCR genes is a major health concern. So much so that CDC is tracking it closely. You can learn more about that here. Resistance to our last-line antibiotic? Yikes! Colistin is not FDA-approved for inhalation, but people give the intravenous product via inhalation anyways in settings of limited to no alternatives. Unfortunately a component of colistin, polymyxin E1, is toxic to lung tissue. Once mixed, inhaled colistin should not be stored for more than 24 hours due to increased concentrations of colistin in the solution. More on this here. Colistin sensitivity testing is an issue. This is a very complicated topic between challenges with breakpoints and suboptimal or difficult to access testing methods. Here is a fun 2017 article by one of my favorite clinical microbiologists on this topic. 1. Li J, et al. Defining the dosage units for colistin methanesulfonate: urgent need for international harmonization. Antimicrobial Agents and Chemotherapy. 2006; 50(12): 4231-2. 2. Nation RL, et al. Consistent global approach on reporting colistin doses to promote safe and effective use. Clinical Infectious Diseases. 2014; 58(1): 139-41. 3. Gauthier TP, et al. Variabiilty within investigations of intravenous colistin: the scope of the problem. Clinical Infectious Diseases. 2014; 58(9): 1340-2. 4. Pike M, Saltiel E. Colistin- and polymyxin-induced nephrotoxicity: focus on literature utilizing the RIFLE classification scheme of acute kidney injury. Journal of Pharmacy Practice. 2014; 27(6): 554-61. 5. Ortwine JK, et al. Colistin: understanding and applying recent pharmacokinetic advances. Pharmacotherapy. 2014; 35(1): 11-6. 6. Nation RL, et al. Dosing guidance for intravenous colsitin in critically ill patients.Clinical Infectious Diseases. 2017; 64(5): 565-71. 7. Pogue J, et al. Are there any ways around the exposure-limiting nephrotoxicity of the polymyxins? International Journal of Antimicrobial Agents. 2016; 48(6): 622-6. 8. Dalfino L, et al. Colistin-associated acute kidney injury in severely ill patients: a step towards better renal care? A prospective cohort study. Clinical Infectious Diseases. 2015; 61(12): 1771-7. 9. Nation RL, et al. Colistin and polymyxin B: peas in a pod, or chalk and cheese? Clinical Infectious Diseases. 2014; 59(1): 88-94. 10. Kassamali Z, Danziger L. To B or not to B, that is the question: is it time to replace colistin with polymyxin B? Pharmacotherapy. 2015; 35(1): 17-21.
International Consensus Guidelines for the Optimal Use of the Polymyxins: Endorsed by the American College of Clinical Pharmacy (ACCP), European Society of Clinical Microbiology and Infectious Diseases (ESCMID), Infectious Diseases Society of America (IDSA), International Society for Anti‐infective Pharmacology (ISAP), Society of Critical Care Medicine (SCCM), and Society of Infectious Diseases Pharmacists (SIDP). Pharmacotherapy. 2019. Acknowledgment: I want to take a second to recognize some of my favorite authors and researchers in the field who study colistin, who you may consider searching for in pubmed should you be interested in high-quality readings on this topic. They are: Roger Nation, Jason Pogue, Kieth Kaye, Jian Li, Brian Tsuji, Jessica Ortwine, Robert Bonomo, Andy DeRyke, and Samira Garonzik. If your not listed, no offense, I probably love your work too! Disclaimer: The author has no conflicts of interest related to this topic and sincerely hopes you never have to give any of your patients colistin or polymyxin B.